The bad news about online images is: there’s no more clip art. Microsoft has discontinued their clip art repository, and clip art is no longer available in Office products. The good news is that you can search the entire Internet for pictures via Bing image search without leaving Word. The search results include only images that are licensed by Creative Commons, meaning you can use them without having to pay a fee. Not all Creative Commons licensed images are free for every usage. Some are free only for non-commercial use, for example. Check a picture’s source and license before you commit to using it in a publication. Position the insertion point where you want the picture to appear. On the Insert tab, click Online Pictures. The Insert Pictures dialog box opens. 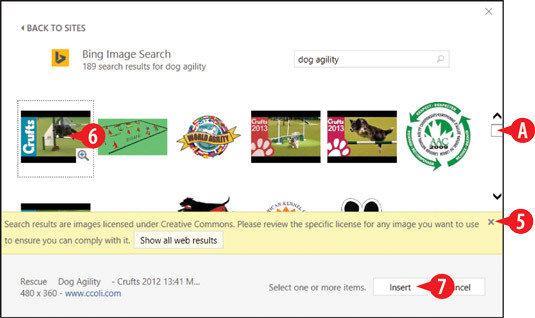 In the Bing Image Search box, type keywords that represent what you want. Click the Search button or press Enter to perform the search. 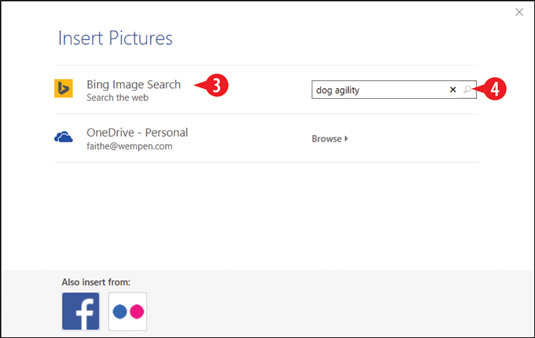 Type your keywords in the Bing Image Search box. Click the Close icon to clear the Creative Commons note from the screen. Scroll down to see more images.